Sen. Bill Frist joins other health officials, including Tennessee Department of Health Commissioner Dr. John Dreyzehner (far left), to discuss strategies and resources for tobacco cessation. Nashville is the epicenter of the nation's health services sector. In fact, healthcare is a $78 billion industry in Middle Tennessee. Yet, like the shoemaker's children standing in their bare feet, Nashville consistently winds up near the bottom of most every ranking when it comes to the health of its population. Addressing this dichotomy was the impetus behind NashvilleHealth, an initiative launched in late 2015 by Sen. William H. Frist, MD, and healthcare veteran Caroline Young. "NashvilleHealth is a convening organization to bring diverse groups together to set collaborative goals and execute action toward improved health," said Young, who serves as executive director. The organization partners with other agencies and thought leaders to take a broad view of health by focusing on behaviors that impact health along with the social determinants that threaten wellbeing. Frist noted, "We have to address the equity issues surrounding health. The zip code you live in is more important than your genetic code ... and the genetic code is important." Calling on his years of experience as a surgeon and a legislator crafting healthcare policy, Frist said, "What a lot of people consider health is really just healthcare services and healthcare delivery - but that's only about 15-20 percent of what defines our overall health and wellbeing." Returning home after representing Tennessee for 12 years in D.C., Frist increasingly wondered how he could best position himself to improve the health of the 650,000 people living in Nashville. The answer was straightforward ... but not easily accomplished. "The goal has to be to address the dramatic gap between Nashville's high quality medical infrastructure and the health of many of our citizens," Frist said. To do that, he reasoned, "It's going to take a countywide, collaborative, inclusive initiative aligning all the nonprofit, for profit, and public health entities around the goal of improving the overall health of individuals, families and members of all of Nashville." Young agreed, "We felt in a city as rich in resources, philanthropy, and know-how, there had to be a better way to improve health outcomes." She continued, "In my work at the Health Care Council, I had seen the positive results when there is a connected network of energetic and talented professionals and hoped to bring some of those learnings to the community health side." Nashville has enjoyed the reputation as one of America's 'it' cities for a number of years. Yet, Frist said the designation would evaporate if health doesn't become a priority for business leaders and policymakers. "It's not sustainable if the health of our population continues to rank below Austin, Dallas-Fort Worth, Raleigh-Durham, Denver ... all our peer cities," he pointed out. Frist noted Tennessee is one of the unhealthiest states in America, and the Robert Wood Johnson Foundation ranks Davidson County 30th out of the state's 95 counties for the factors that drive health. High obesity, smoking and infant mortality rates don't make a great sales pitch when trying to attract new companies to Nashville. "If you move here, you have a higher chance of your baby dying than anywhere else in the country ... it's not exactly a Chamber message," Frist said wryly. "Health is fundamental to the economic prosperity of Nashville/Davidson County. Without a healthy workforce, our jobs cannot be maximized. Our economy and the city will lose." It's a message that increasingly resonates with city leaders. Leveraging expertise and support from the business community is one of the reasons the NashvilleHealth Board of Directors includes senior leadership from Bridgestone, UBS, the Nashville Area Chamber of Commerce and Vector Management alongside healthcare industry titans. Similarly, the organization's Steering Committee draws from a cross section of industries, public entities, and community organizations to inform the program of work. "The Steering Committee is comprised of 25 individuals who really represent the diverse determinants of health in our city - health, safety, environment, the faith community, academic community, and environment," said Young. "These are the people in the trenches with expertise and who are guiding our work." Young said NashvilleHealth partnered with the Vanderbilt Department of Health Policy early on to explore areas of need. Recognizing every issue couldn't be addressed at once, a great deal of due diligence helped identify critical needs. Ultimately, Young said, the organization decided to focus on three main areas to start: tobacco use, hypertension and child health. The next step was to hold community meetings to bring in local and national experts around these issues. Young explained within each of the three key topics, NashvilleHealth is adopting strategies that fall into four areas of engagement - clinical interventions, community engagement, mass media, and policy advocacy. "We now have suggested interventions in each of these focus areas that we are collaboratively pursuing," said Young. "There was already great work going on among our partners. We've been really honored to help amplify these local efforts." Tobacco Use: "Tennessee has one of the highest smoking rates in the nation at 22 percent, and Nashville is right at 21 percent. The CDC goal is 12 percent," said Frist. "There are 40,000 more people smoking here in Nashville than in other cities on average." To help move the needle on smoking cessation, NashvilleHealth is one of the collaborators on 'Quittin' Time in Tennessee.' 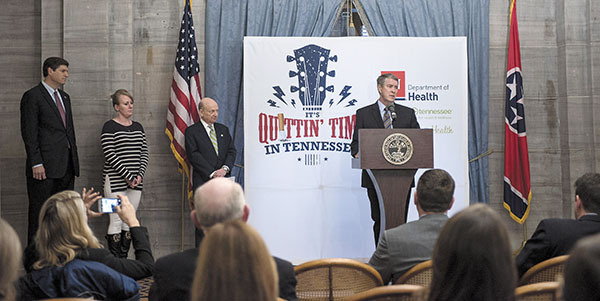 Young noted, "With Quittin' Time, we are working with the Tennessee Department of Health and the Governor's Foundation for Health and Wellness to shine a spotlight on tobacco use in Tennessee and connect those who want to quit with resources." Mayor Megan Berry kicks off an exciting new initiative to improve women's heart health in Nashville. Hypertension: In 2013, 23 percent of Nashville deaths were due to heart disease, according to the CDC. NashvilleHealth is part of a new six-member community steering committee that includes the Women's Health Alliance, the Office of Mayor Megan Barry, Metro Public Health Department, Meharry-Vanderbilt Alliance and Saint Thomas Ascension Health for a first-of-its-kind effort to make a broad impact on heart disease and stroke in women. Nashville was selected as the debut site of the Cities and Communities with Heart Initiative, which kicked off in late February. Child Health: In addition to a high infant mortality rate, nearly 30 percent of Nashville children live in poverty and Davidson County ranks 87th out of the state's 95 counties for child wellbeing. NashvilleHealth and partners are looking at interventions addressing a host of issues impacting children from infancy onward. 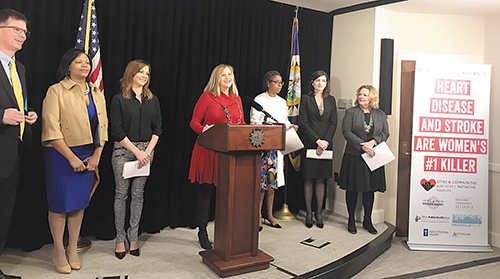 "We're very excited to be a part of the Nashville Infant Vitality Collaborative led by Metro Public Health Department and Meharry Medical College with support from CityMatch with a goal of making sure more babies see their first birthday in Nashville," Young said. "Through data and community feedback, we learned unsafe sleep is a leading cause of infant death so with partners, we're launching a public awareness campaign on safe sleep practices," she added. To make a difference in the health of the population, Frist said there were three key phases, starting with the recognition a problem exists. The second phase was to identify innovative solutions to target the biggest areas of need. Now, Frist continued, it's time to move to the third phase. "We have to deploy those solutions or otherwise individuals are going to die earlier than the generation before and live less healthy lives." The bottom line, Frist concluded, is to make a demonstrable difference. "Our goal is to improve the health and wellbeing of all Nashvillians in a measurable way."